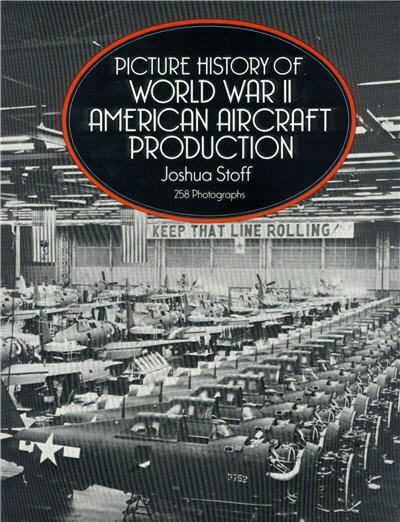 Picture History of World War II American Aircraft Production by Joshua Stoff Over 250 rare photographs depict one of the greatest industrial feats of World War II—indeed, of all time: the massive production of military aircraft by American manufacturers. Photos show teams of workers turning out Boeing B-17 bombers in Seattle, huge B-24D Liberators at the Ford plant in Willow Run, F6F Grumman Hellcat fighters in Bethpage, Long Island, and much, much more. In his Introduction and captions, the author outlines the history of this great effort, explains production processes, and describes aircraft construction, assembly and armament. Joshua Stoff is Air and Space Curator, Cradle of Aviation Museum, Mitchel Field, Long Island, New York. 179 pgs, SB, 9 x 12, 258 photos.